Product prices and availability are accurate as of 2019-04-20 15:39:14 EDT and are subject to change. Any price and availability information displayed on http://www.amazon.com/ at the time of purchase will apply to the purchase of this product. 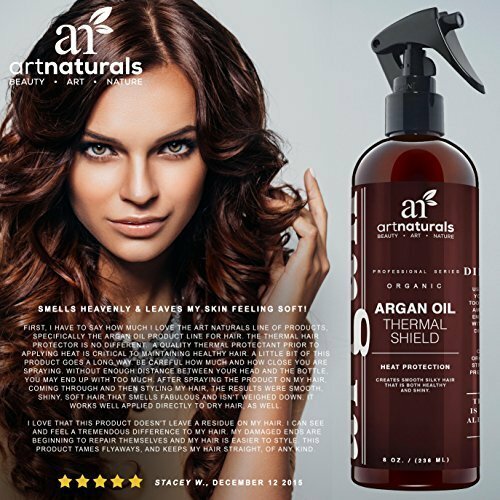 "Before you blow dry one more time, let ArtNaturals’ Thermal Shield Leave-In Conditioner come to the rescue of dry, split hair. Whether hair’s hurting from too much heat, humidity, or sun exposure, natural extracts of rosemary, peach, thyme, sage, and ginseng re-moisturize, then provide a barrier against more damage. Hair is restored to luster and shine. If it could smile, it would. Our spray-on, leave-in Thermal Shield protects hair against everything we do to abuse it. It conditions for all-day moisturizing, with ¬natural herbal extracts supplying deep layers of moisture while providing a barrier of protection against heat. ¬It’s a natural detangler for unwieldy and thick hair. And perfect for use before outdoor activities. Rosemary extract helps stimulate hair follicles, making hair grow longer and stronger. Current research shows it also helps slow down hair loss. Peach extract’s multiple benefits for hair include acting an emollient to enable hair to retain natural color as well as chemically applied color. It also helps protect hair from sun, wind, rain and pollution. It deters frizz and helps prevent breakage and tangles. Thyme extract stimulates the scalp, helping keep both it and hair healthy. Sage extract keeps hair shiny, more manageable and improves texture. And ginseng extract improves hair’s regeneration ability, along with the health of hair follicles and cells, preventing hair loss. The Thermal Shield stops hair from becoming brittle, cracked, and dry and helps to restore split ends. Result: Shiner, bouncier, healthier and more lustrous locks!" Shield your hair from the effects of heat and sun damage by infusing it with natural oils Natural extracts of rosemary, peach, thyme, sage, and ginseng provide deep layers of moisture and healing. Leave in conditioner and heat protector in one! 100% all-natural ingredients. 100% satisfaction guaranteed or your money back.